The national flag of Greece, popularly referred to as the "sky-blue - white" or the "blue-white" (Greek: Γαλανόλευκη or Κυανόλευκη), officially recognised by Greece as one of its national symbols, is based on nine equal horizontal stripes of blue alternating with white. There is a blue canton in the upper hoist-side corner bearing a white cross; the cross symbolises Eastern Orthodox Christianity, the established religion of the Greek people of Greece and Cyprus. The blazon of the flag is Azure, four bars Argent; on a canton of the field a Greek cross throughout of the second. The official flag ratio is 2:3. The shade of blue used in the flag has varied throughout its history, from light blue to dark blue, the latter being increasingly used since the late 1960s. It was officially adopted by the First National Assembly at Epidaurus on 13 January 1822. According to popular tradition, the nine stripes represent the nine syllables of the phrase "Ελευθερία ή Θάνατος" ("Freedom or Death"), the five blue stripes for the syllables "Ελευθερία" and the four white stripes "ή Θάνατος". The nine stripes are also said to represent the letters of the word "freedom" (Greek: ελευθερία). There is also a different theory, that the nine stripes symbolise the nine Muses, the goddesses of art and civilisation (nine has traditionally been one of the numbers of reference for the Greeks). Blue and white have been interpreted as symbolising the colours of the famed Greek sky and sea. The origins of today's national flag with its cross-and-stripe pattern are a matter of debate. Every part of it, including the blue and white colors, the cross, as well as the stripe arrangement can be connected to very old historical elements; however, it is difficult to establish "continuity", especially as there is no record of the exact reasoning behind its official adoption in early 1822. It has been suggested by some Greek historians that the current flag derived from an older design, the virtually identical flag of the powerful Cretan Kallergis family. This flag was based on their coat of arms, whose pattern is supposed to be derived from the standards of their claimed ancestor, Byzantine Emperor Nicephorus II Phocas (963–969 AD). This pattern (according to not easily verifiable descriptions) included nine stripes of alternating blue and white, as well as a cross, assumed to be placed on the upper left. Although the use of alternating blue and white - or silver - stripes on (several centuries-old) Kallergis' coats of arms is well documented, no depiction of the above described pattern (with the nine stripes and the cross) survives. The stripe-pattern of the Greek flag is visibly similar to that used (though with different colors) in several other flags that have appeared over the centuries, most notably that of the British East India Company's pre-1707 flag or the flag of the United States. This design, from the 14th century during the Palaiologan dynasty, is the only attested flag of the Byzantine Empire. There is no mention of any "state" flag until the mid-14th century, when a Spanish atlas, the Conosçimiento de todos los reynos depicts the flag of "the Empire of Constantinople" combining the red-on-white Cross of St George with the "tetragrammatic cross" of the ruling house of the Palaiologoi, featuring the four betas or pyrekvola ("fire-steels") on the flag quarters representing the imperial motto Βασιλεύς Βασιλέων Βασιλεύων Βασιλευόντων ("King of Kings Reigning over those who Rule"). The tetragrammatic cross flag, as it appears in quarters II and III in this design, is well documented. In the same Spanish atlas this "plain" tetragrammatic cross flag is presented as (among other places in the Empire) "the Flag of Salonika" and "the real Greece and Empire of the Greeks (la vera Grecia e el imperio de los griegos)". The (quartered) arrangement that includes the Cross of St. George is documented only in the Spanish atlas, and most probably combines the arms of Genoa (which had occupied Galata) with those of the Byzantine Empire, and was most probably flown only in Constantinople. Pseudo-Kodinos records the use of the "tetragrammatic cross" on the banner (phlamoulon) borne by imperial naval vessels, while the megas doux displayed an image of the emperor on horseback. The merchant vessel Panagia tis Ydras, built 1793, flying the Graeco-Ottoman flag. During the Ottoman rule several unofficial flags were used by Greeks, usually employing the Byzantine double-headed eagle (see below), the cross, depictions of saints and various mottoes. The Christian Greek sipahi cavalry employed by the Ottoman Sultan were allowed to use their own, clearly Christian flag, when within Epirus and the Peloponnese. It featured the classic blue cross on a white field with the picture of St. George slaying the dragon, and was used from 1431 until 1639, when this privilege was greatly limited by the Sultan. Similar flags were used by other local leaders. The closest to a Greek "national" flag during Ottoman rule was the so-called "Graeco-Ottoman flag" (Γραικοθωμανική παντιέρα), a civil ensign Greek Orthodox merchants (better: merchants from the Greek-dominated Orthodox millet) were allowed to fly on their ships, combining stripes with red (for the Ottoman Empire) and blue (for Orthodoxy) colours. After the Treaty of Küçük Kaynarca, Greek-owned merchant ships could also fly the Russian flag. During the uprising of 1769 the historic blue cross on white field was used again by key military leaders who used it all the way to the revolution of 1821. It became the most popular Revolution flag, and it was argued that it should become the national flag. The "reverse" arrangement, white cross on a blue field, also appeared as Greek flag during the uprisings. This design had apparently been used earlier as well, as a local symbol (a similar 16th or 17th century flag has been found near Chania). The flag of Greece as drawn by Rigas Feraios in his manuscripts. Bishop Germanos of Patras blessing the flag of the Greek revolutionaries at the Monastery of Agia Lavra, part of a popular legend regarding the start of the revolution of 1821, although it never actually happened. Prior and during the early days of the Greek War of Independence (1821–1829), a large variety of flags was designed, proposed and used by various Greek intellectuals in Western Europe, local leaders, chieftains and regional councils. Aside from the cross, many of these flags featured saints, the phoenix (symbolising the rebirth of the Greek nation), mottoes such as "Freedom or Death" (Ελευθερία ή Θάνατος) or the fasces-like emblems of the Philiki Etaireia, the secret society that organised the uprising. The old land flag, still flying over the Old Parliament House in Athens. On 15 March 1822, the Provisional Government, by Decree Nr. 540, laid down the exact pattern: white cross on blue (plain) for the land flag; nine alternate-coloured stripes with the white cross on a blue field in the canton for the naval ensign; and blue with a blue cross on a white field in the canton for the civil ensign (merchant flag). On 30 June 1828, by decree of the Governor Ioannis Kapodistrias, the civil ensign was discontinued, and the cross-and-stripes naval ensign became the national ensign, worn by both naval and merchant ships. This design became immediately very popular with Greeks and in practice was often used simultaneously with the national (plain cross) flag. On 7 February 1828 the Greek flag was internationally recognised for the first time by receiving an official salutation from British, French, and Russian forces in Nafplio, then the capital of Greece. The first official specifications for the war flag or naval ensign, published 3 June 1833. After the establishment of the Kingdom of Greece in 1832, the new king, Otto, added the royal Coat of Arms (a shield in his ancestral Bavarian pattern topped by a crown) in the centre of the cross for military flags (both land and sea versions). The decree dated 4 (16) April 1833 provided for various maritime flags such as the war flag or naval ensign (set at 18:25), pennant, royal standard (set at 7:10) and civil ensign (i.e. the naval ensign without coat of arms). A royal decree dated 28 August 1858 provided for details on the construction and dimensions concerning the flags described in the 1833 decree and other flags. After Otto's abdication in 1862, the royal coat of arms was removed. In 1863, the 17-year old Danish prince William was selected as Greece's new king, taking on the name George I. A royal decree dated 28 December 1863 introduced crowns into the various flags in place of the coat of arms. Similar arrangements were made for the royal flags, which featured the coat of arms of the House of Schleswig-Holstein-Sonderburg-Glücksburg on a square version of the national flag. A square version of the land flag with St. George in the centre was adopted on 9 April 1864 as the Army's colours. The exact shape and usage of the flags was determined by Royal Decree on 26 September 1867. By a new Royal Decree, on 31 May 1914, the various flags of Greece and its military were further regulated. By this decree, the flag with the crown was adopted for use as a state flag by ministries, embassies and civil services, while the sea flag (without the crown) was allowed for use by private citizens. On 25 March 1924, with the establishment of the Second Hellenic Republic, the crowns were removed from all flags. On 20 February 1930, the national flag's proportions were established at a 2:3 ratio, with the arms of the cross being "one fifth of the flag's width". The land version of the national flag was to be used by ministries, embassies, and in general by all civil and military services, while the sea flag was to be used by naval and merchant vessels, consulates and private citizens. On 10 October 1935, Georgios Kondylis declared that the monarchy had been restored. By decree of 7 November 1935, the 31 May 1914 decree was restored. Thereby, the crown was restored on the various flags. The crown was again removed by the military dictatorship in 1967, following the aborted counter-coup and subsequent self-exile of King Constantine II on 13 December. The sea flag was established as the sole national flag in 1969, using a very dark shade of blue, and on 18 August 1970, the flag ratio was changed to 7:12. After the restoration of democracy in August 1974, the land flag was restored for a while (per Law 48/1975 and Presidential Decree 515/1975, on effect on 7 June 1975) until 1978. It is widely believed that the colours of the Greek flag come from the blue of the sky and the white of the waves. 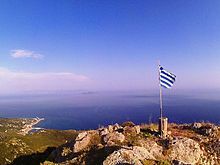 Several Greek researchers have attempted to establish a continuity of usage and significance of the blue and white colours, throughout Greek history. Usages cited include the pattern of blue and white formations included on the shield of Achilles, the apparent connection of blue with goddess Athena, some of Alexander the Great's army banners, possible blue and white flags used during Byzantine times, supposed coats of arms of imperial dynasties and noble families, uniforms, emperors' clothes, patriarchs' thrones etc., 15th century versions of the Byzantine Imperial Emblems  and, of course, cases of usage during the Ottoman rule and the Greek revolution. On the other hand, the Great Greek Encyclopedia notes in its 1934 entry on the Greek flag that "very many things have been said for the causes which lead to this specification for the Greek flag, but without historical merit". In 1978 the sea flag was adopted as the sole national flag, with a 2:3 ratio. The flag is used on both land and sea is also the war and civil ensign, replacing all other designs surviving until that time. No other designs and badges can be shown on the flag. To date, no specification of the exact shade of the blue colour of the flag has been issued. Consequently, in practice hues may vary from very light to very dark. The Greek Flag Day is on 27 October. Not be torn or damaged in any way. If the flag is damaged, it should be burned in a respectful manner. The flag can be displayed by civilians on days specified by the ministry of internal affairs, as well as in sporting events and other occasions of the sort. When displayed vertically, the canton must be on the left side of the flag from the point of view of the spectator. Used as a logo for any corporation or organization, even at different proportions. When placed on top of a coffin, the canton must always be on the right of the person's head. The National Flag of Greece is cyan and white, it is made up of nine (9) stripes equal in width, of which five (5) are cyan and four (4) are white so that the upper and lower stripes are cyan and the others inbetween are white. Because of the use of the word 'cyan' (Greek: κυανός, Kyanos), which can also mean 'blue' in Greek, the exact shade of blue remains ambiguous. Although it implies the use of a light shade of blue, such as on the flag of the United Nations, the colours of the Greek flag tend to be darker, especially during the dictatorship and in recent years, with the exception of the years of the rule of King Otto, when a very light shade of blue was used. Consequently, the shade of blue is largely left to the flagmakers to decide, as shown in the table below. No Day decorations in Poros. Law 851/1978 sets the general outline for when the specific days on which the flag should be raised. Raising the flag on national or local public holidays is mandatory for everyone, from 8am until sunset. For national holidays, this applies country-wide, but on local ones it only applies to those areas where the said holiday is being celebrated. Additionally, the flag may also be flown on days of national mourning, half-mast. The Minister of the Interior has the authority to proclaim flag days if they are not already proclaimed, and proclaiming regional flag days is vested with the elected head of each regional unit (formerly prefectures). 25 March 25th of March Anniversary of the traditional start date for the Greek War of Independence. 28 October Ochi Day (No Day) Anniversary of the refusal to accept the Italian ultimatum in 1940. 17 November Polytechnic Day Anniversary of the Athens Polytechnic uprising against the military junta (school holiday). Although 17 November is not an official national holiday, Presidential Decree 201/1998 states that respects are to be paid to the flag on that particular day. In the Army war flags are normally carried by infantry, tank and special forces regiments and battalions, by the Evelpidon Military Academy, the Non-Commissioned Officers Academy and the Presidential Guard when in battle or in parade. However, flying a war flag in battle is unlikely with current warfare tactics. Since the Fire Service and the Hellenic Police are considered civilian agencies, they are not assigned war flags. They use the National Flag instead. Identical rules were applied to the former Cities Police. However, recently the Police Academy has been assigned a war flag, and they paraded for the first titme with this flag on Independence Day, March 25, 2011. The flag is similar to the Army war flag, with the image of St George replaced with that of Artemius of Antioch. Throughout the history of Greece, various heads of state have used different flags. The designs differ according to the historical era they were used in and in accordance with the political scene in Greece at the time. 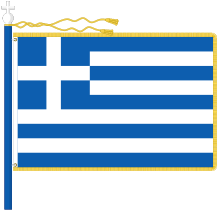 The first flag to be used by a head of state of Greece was that of King Otto of Greece. Following the establishment of the Kingdom of Greece in 1832, the 17-year old Bavarian prince Otto was selected as king for the newfound monarchy. A royal decree dated 4 (16) April 1833 prescribed a number of maritime flags, including the royal standard. This flag, set at a 7:10 ratio, was a variant of the Greek white-cross-on-blue and featured the ancestral coat of arms of the Wittelsbach dynasty at its centre. The construction and dimensions of this flag was further described by a decree dated 28 August 1858, which also changed the proportions of the flag from 7:10 to 3:2. Following Otto's abdication in 1862, the Wittelsbach coat of arms would subsequently be removed. In 1863, the 17-year old Danish prince William was selected as Greece's new king, taking on the name George I. A royal decree dated 28 December 1863 prescribed that the king's standard would retain the same dimensions and basic design of the previous flag. At the flag's centre, the royal coat of arms of the new dynasty (Schleswig-Holstein-Sonderburg-Glücksburg) would feature. By a new royal decree of 3 June 1914, the distinguishing flags to be utilised by the various members of the royal family were described. The king's flag was defined as being square in shape and, as in previous flags, featured the coat of arms of the king on a Greek white-cross-on-blue. As the king at the time, Constantine I, was made a field marshal the previous year, the coat of arms on his flag featured a heraldic representation of the Marshal's baton in twos, crossed behind his coat of arms. With the establishment of the Second Hellenic Republic in 1924, the king's flag was made redundant. In 1930, a presidential decree described the president's flag as being a square version of the usual cross flag, devoid of any distinguishing markings. On 10 October 1935, Georgios Kondylis declared that the monarchy had been restored and the 3 June 1914 decree was restored by decree of 7 November 1935. This flag, and the flags of other members of the royal family, was replaced the following year with new designs. Unlike previous designs, all flags now featured the coat of arms of the dynasty at its centre and would be distinguished by the number of crowns present at each of the four corners of the flags: The flag of the king featured a crown on each of the corners of the flag. This was the last design of a royal standard to be adopted prior to the eventual formal abolition of the monarchy in 1973. The president's flag is currently prescribed by Presidential Decree 274/1979. The double-headed eagle was the symbol of the Palaiologoi dynasty. One of the most recognisable (other than the cross) and beloved Greek symbols, the double-headed eagle, is not a part of the modern Greek flag or coat of arms (although it is officially used by the Greek Army, the Church of Greece, the Cypriot National Guard and the Church of Cyprus, and was incorporated in the Greek coat of arms in 1926 ). One suggested explanation is that, upon independence, an effort was made for political — and international relations — reasons to limit expressions implying efforts to recreate the Byzantine Empire. Yet another theory is that this symbol was only connected with a particular period of Greek history (Byzantine) and a particular form of rule (imperial). More recent research has justified this view, connecting this symbol only to personal and dynastic emblems of Byzantine Emperors. Some Greek sources have attempted to establish links with ancient symbols: the eagle was a common design representing power in ancient city-states, while there was an implication of a "dual-eagle" concept in the tale that Zeus left two eagles fly east and west from the ends of the world, eventually meeting in Delphi, thus proving it to be the centre of the earth. However, there is virtually no doubt that its origin is a blend of Roman and Eastern influences. Indeed, the early Byzantine Empire inherited the Roman eagle as an imperial symbol. During his reign, Emperor Isaac I Comnenus (1057–59) modified it as double-headed, influenced by traditions about such a beast in his native Paphlagonia in Asia Minor (in turn reflecting possibly much older local myths). Many modifications followed in flag details, often combined with the cross. After the recapture of Constantinople by the Byzantine Greeks in 1261, two crowns were added (over each head) representing — according to the most prevalent theory — the newly recaptured capital and the intermediate "capital" of the empire of Nicaea. There has been some confusion about the exact use of this symbol by the Byzantines; it appears that, at least originally, it was more a "dynastic" and not a "state" symbol (a term not fully applicable at the time, anyway), and for this reason, the colours connected with it were clearly the colours of "imperial power", i.e., red and yellow/gold. After the Ottoman conquest, however, this symbol also found its way to a "new Constantinople" (or Third Rome), i.e. Moscow. Russia, deeply influenced by the Byzantine Empire, saw herself as its heir and adopted the double-headed eagle as its imperial symbol. It was also adopted by the Serbs, the Montenegrins, the Albanians and a number of Western rulers, most notably in Germany and Austria. ^ The Flag Bulletin, Volumes 15–17, Flag Research Center, 1976, p. 63: "Greeks wanted this color for their flag because they have always looked at the blue sky and the blue ocean." ^ Kazhdan, Alexander, ed. (1991). Oxford Dictionary of Byzantium. Oxford University Press. pp. 472, 999. ISBN 978-0-19-504652-6. ^ Kazhdan, Alexander, ed. (1991). Oxford Dictionary of Byzantium. Oxford University Press. pp. 472–473. ISBN 978-0-19-504652-6. ^ a b Ἑλλάς - Ἑλληνισμὸς [Greece - Hellenism]. Μεγάλη Ἐλληνικὴ Ἐγκυκλοπαιδεῖα (in Greek). 10. Athens: Pyrsos Co. Ltd. 1934. p. 242. ^ Government of Greece (3 June 1833). "Περί της Πολεμικής και Εμπορικής Σημαίας του Βασιλείου" [Regarding the Naval and Commercial Flag of the Kingdom]. Government Gazette. Retrieved 18 August 2012. ^ Law 851/21-12-1978 On the national Flag, War Flags and the Distinguishing Flag of the President of the Republic, Gazette issue A-233/1978. ^ a b c Album des pavillons nationaux et des marques distinctives. Brest, France: S.H.O.M. ; 2000. p. 238. ^ a b Flag Manual. Beijing, China: Beijing Organizing Committee for the Games of the XXIX Olympiad – Protocol Division; 2008. p. B15. ^ a b Flags and Anthems Manual. London, United Kingdom: London Organising Committee of the Olympic Games and Paralympic Games Limited; 2012. p. 47. ^ O. Zotiadis (January 2001). "Greek". Military Review. Hellenic Army General Staff. ^ a b Presidential Decree 348 /17-4-1980, On the war flags of the Armed Forces and the Gendarmerie Corps, Gazette issue A-98/1980. ^ Presidential Decree 991/7-10-1980, Specification of the size of the National Flag born by the Coast Guard, Cities Police and Fire Service and the length of its staff, Gazette issue A-247/1980. I. Nouchakis, Η Σημαία μας (Our Flag), Athens 1908. This page was last edited on 3 April 2019, at 18:00 (UTC).